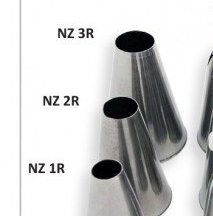 JEM Seamless Stainless Steel Round & Star Savoy Piping Nozzles, ideal for running beads, dots and lines. Also great to use with cream, mashed potato and choux pastry. Also ideal for shells, rosettes and decorations with many ridges. Also great to use with cream, mashed potato and choux pastry. Easy to clean and hygienically wrapped with high quality, durable, Eco-friendly packaging.